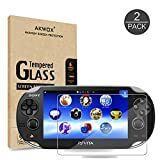 The Screen Protector for PS Vita 1000, make of Highest quality Tempered-Glass, offer best protection for your original screen from shattering,with an industry leading hardness of 9H. Featuring maximum protection from high impact drops, scratches, scrapes, and bumps direct to the screen. Designed for Sony Playstation Vita 1000,Precise laser cut designed specifically to offer max body coverage. Super easily installation:Allows adjustments during installation,Significantly reduces dust, oil and fingerprint smudges. 1 Retail package includes: 2pcs tempered glass screen protector for PSV 1000, 2 wet and dry Screen Cleaning Paper,2 Sticker.